When you first visit a West Indian market that specializes in Caribbean ingredients, you may be surprised at the variety of East Indian ingredients. In reality, it’s not that surprising at all. Simply put, after the British colonies abolished slavery in 1833 they looked to a cheaper form of labor – indentured servitude. The laborers were immigrants from Europe, China, and India who were looking for jobs or a better opportunity. Unfortunately, they were treated little better than slaves. These individuals brought their culture and food to the Caribbean, adding another layer to the Caribbean Creole cuisine we know today. There’s a large population of Indo-Caribbean people who are the decedents of the original indentured workers. They have settled throughout the islands, but are most notable in Trinidad and Tobago, Guyana, Suriname, and Jamaica. 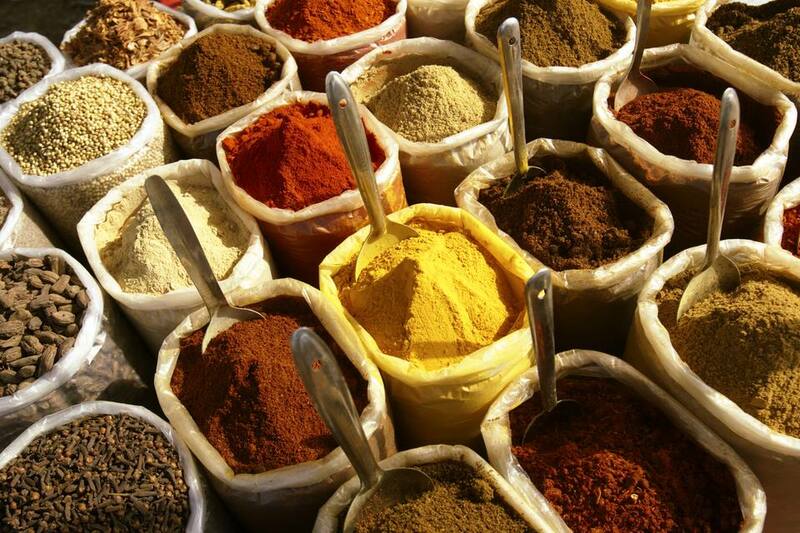 Here is a list of typical Indian spices that you might find in a Caribbean market. The Caribbean names may differ slightly from the Hindi names. Indentured workers from India arrived in the Caribbean in the mid-1800s. They made curry a vital part of West Indian cuisine. Curry is especially popular in the English speaking islands of Trinidad and Tobago, and Jamaica. Colombo powder, or poudre de colombo, is similar to curry powder. but, it contains a unique ingredient: roasted uncooked rice. Colombo seasoning is used mostly on the French islands of Guadeloupe, Martinique, St. Martin and St. Barts. It gets its name from the city of Colombo in Sri Lanka. Garam Masala is another Indian spice mix used in Caribbean cooking. It doesn't contain turmeric or chilies, therefore it's a milder spice. Garam masala is added near the end of cooking time of a recipe. It can be used by itself or added to a curry dish. Cumin is also called Gebrah or Jeera. Cumin is a key ingredient in Colombo powder, curry powder, and garam masala. Most Caribbean curry dishes begin by sautéing cumin seeds in a little oil before adding other ingredients. This adds a nice earthy flavor and fragrance as well as a warm peppery bite to curries, soups, chutneys, dals, breads, chokas, meats, and vegetables. It’s even used in salads and beverages. Nigella seeds are also called mangrice, black cumin, onion seeds, and kalonji. These tiny black seeds come from a flowering herb, which has a carrot-like, earthy flavor. The seeds resemble onion seeds and have a gentle onion taste. This spice is roasted, ground, or sautéed before it’s used in breads, raitas, salads, lentils, chutney, and vegetable dishes. Fenugreek is also called mathee or methi. The leaves of the fenugreek plant are cooked and eaten like greens or dried and used to season meats. The taste is similar to arugula. The seeds are collected from pods that the plant produces and then roasted or sautéed. The slightly bitter seeds are used to season hot and sour soups, vegetable dishes, dals, pickles, fish, and seafood. Neem Leaf is also called Vapu. This herb is used to season vegetables, stews, curries, and dal recipes. It has a bitter taste and pungent aroma. It’s also a medicinal herb used to stimulate appetite, relieve headaches, and clear intestinal worms.